How to ask "Where are you from?" and "What nationality are you?" In this Thai language blog, we will learn how to ask “Where are you from?” and “What nationality are you?” in the Thai language. When travelling around Thailand you will hear this question a lot as Thai’s are often interested to know where foreigners come from :-). 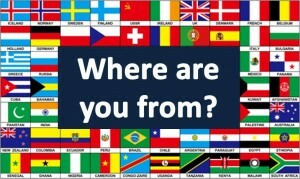 So now you can ask or answer questions about nationality and which country are you from in the Thai language. I hope you get the chance to practice this in Thailand.